With one of our annual season tickets or 14-day tickets you can visit over forty of the most beautiful sights in Bavaria, except special events. An annual season ticket will be valid for one year after your first visit, a 14-day ticket for 14 days. The annual season tickets and 14-day tickets are available at the ticket offices in all our palaces, castles and other sights (excluding the King's House on Schachen and Dachau Palace). You can also buy the tickets at the Infopoint Museen & Schlösser in Bayern or at our online bookshop. The tickets are not transferable. Leaflet "The annual season tickets and 14-day tickets of the Bavarian Palace Department"
The "Königsschlösser" combination ticket is available at the cash desks of the three palaces Neuschwanstein, Linderhof and Herrenchiemsee as well as at our online bookshop. The ticket is valid for six months; you can visit each of the palaces Neuschwanstein, Linderhof, and Herrenchiemsee once except special events. All the tickets are valid for the period in question from the date of your first visit. The tickets are not transferrable and are only valid for the user(s) entered on them. Partner or family tickets must be signed by both users or the two adults. Please note that you may be asked at the cash desk for an identity document with a photo. The annual family tickets are valid for two adults and their children, who must be under 18 years of age. 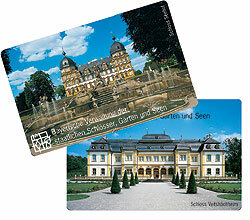 You can find all the sights that you can visit with our tickets also in our Leaflet "The annual season tickets and 14-day tickets of the Bavarian Palace Department". Children under the age of 18 are admitted free to the properties of the Bavarian Palace Department and don’t therefore need their own annual or 14-day tickets. You will be issued with a free children’s entrance ticket at the cash desk. Can I print the tickets out myself if I order them online? You cannot unfortunately print the tickets out yourself. If you’ve ordered them online, they’ll be sent to you by post. Please be aware that they may take longer to reach you if you’ve ordered them from abroad. Please note: The tickets are also available at the cash desks of all the sights (see above). Will the ticket save me having to wait at the cash desk? Because there are different means of access to the properties and some of them involve a guided tour, you’ll unfortunately have to go to the cash desk to get your free ticket and won’t therefore always be able to avoid waiting. We regret that it’s not possible to be admitted simply by showing your 14-day, annual or "Königsschlösser" combination ticket. You can basically visit all our properties without reserving in advance. Reservation may sometimes be necessary for groups; you can find the corresponding information on the websites of the individual palaces. However, in the case of Neuschwanstein, which has large numbers of visitors, we do recommend that you reserve a ticket at the ticket centre in Hohenschwangau well in advance for the day you want. Otherwise you may have a long wait or may even not be able to get a ticket. Because of the large numbers of visitors to this sight, we recommend that you reserve a ticket for Neuschwanstein at the ticket centre in Hohenschwangau well in advance for the day you want. 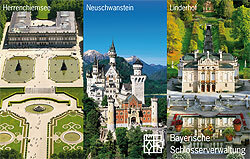 Tickets for Neuschwanstein can be reserved online at www.hohenschwangau.de/ticketcenter.0.html. If you have a 14-day ticket, an annual season ticket or the "Königsschlösser" combination ticket, please simply reserve a "normal" ticket for the time you want. You will be asked for credit card details to guarantee your booking, but the card will not be charged. When you collect your ticket from the ticket centre in Hohenschwangau, present your valid 14-day, annual or "Königsschlösser" combination ticket; you will then only be required to pay the reservation fee. Please note that Hohenschwangau Palace is not administered by the Bavarian Palace Department and hence cannot be visited with the 14-day ticket, annual ticket or "Königsschlösser" combination ticket! Are guided tours included in the ticket? In properties that can only be visited by taking a guided tour, this is of course included in the 14-day, annual or "Königsschlösser" combination ticket. Special tours or tours on particular topics for which there is a charge must however be paid for separately. The tickets are already priced at a particularly low rate; we therefore regret that no further reductions can be offered.